Sgt. 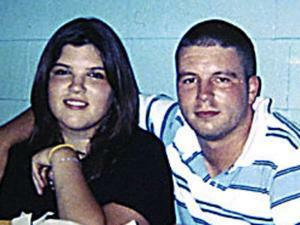 Matthew J. Fenton with his sister, Courtney, in 2005. Hometown: Little Ferry, New Jersey, U.S.
Died: May 5, 2006 in Operation Iraqi Freedom. Unit: Marines, Marine Forces Reserves Inspector and Instructor Staff, 1st Battalion, 25th Marine Regiment, 4th Marine Division, Fort Devens, Mass. Like any mother, Diane Fenton worried when her son shipped off to Iraq. But her son, Sgt. 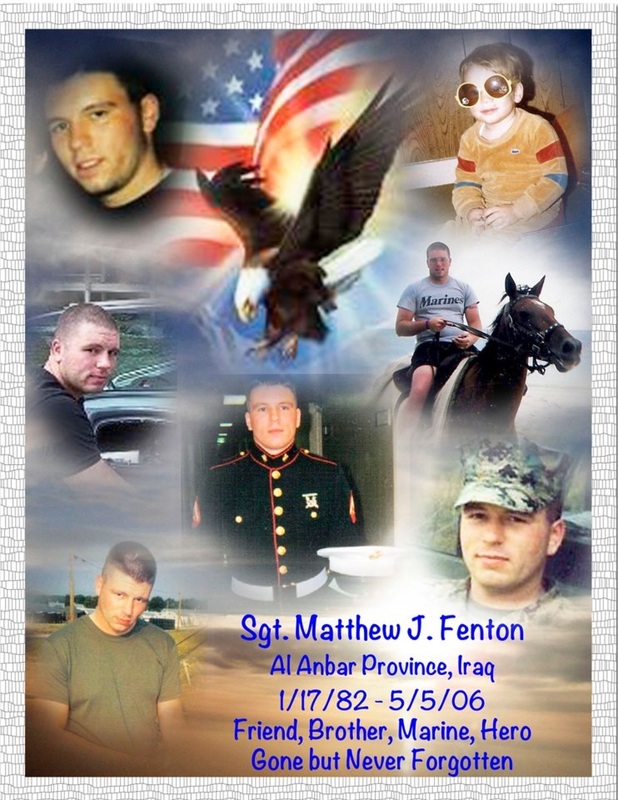 Matthew Fenton, was a Marine. And like any Marine, he wanted to go where his country needed him. 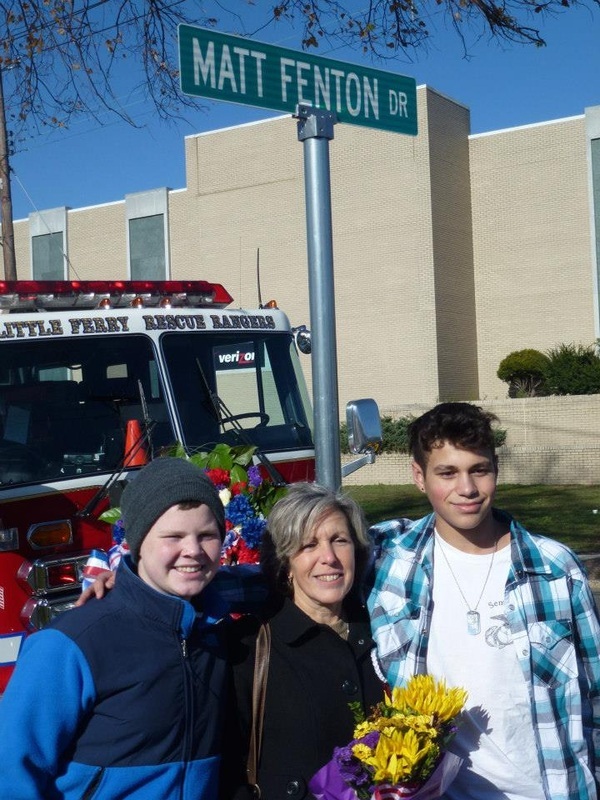 So Matthew and Diane Fenton said their goodbyes in March, and the 24-year-old from Little Ferry promised his mother he would e-mail every day. He made good on that promise, and for weeks, Diane Fenton had regular reminders that her son was all right. "Until one night he didn't e-mail," said Allison Valentin, Fenton's aunt and godmother. A bomb exploded near a vehicle Fenton was riding in near Fallujah on April 26. Shrapnel tore into his head, and he eventually was moved to Bethesda Naval Hospital in Maryland. He died Friday, authorities said. "He was just proud to be serving this county," said Drew Vagts, Fenton's 44-year-old uncle who lives in Old Bridge. Fenton grew up in Bergen County, where as a child he used to pretend he was a soldier. "He always liked playing with toy guns," said Diane Fenton, 49, who works in the accounting office of a bank. "He wanted to be a Marine because he wanted to be the best." Matthew Fenton grew into a muscular and outgoing young man, his family said. He had brown hair, brown eyes and a reputation for toughness. "He was someone that you wouldn't want to mess with," said Marine Lance Cpl. Matthew Fatovic, who is 21 and had met Fenton through his cousin. 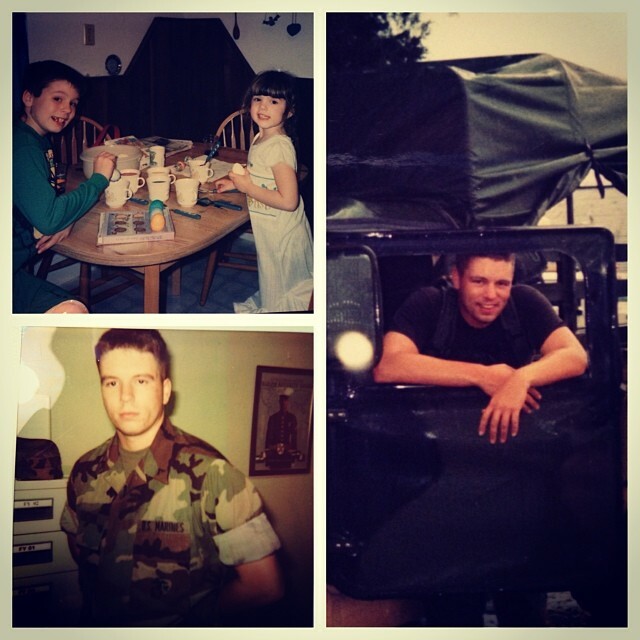 Fenton joined the Marines shortly after graduating from high school. His mother was against the idea. But she came to accept it. Being a Marine was her son's driving ambition. "That's what made him Matthew," she said. Fenton was stationed in Okinawa, Japan; Cherry Point, N.C.; and then Fort Devons, Mass. On March 9, he shipped out to Iraq. "He volunteered to go," his mother said. "He wanted to be with the other Marines." Diane Fenton had trouble sleeping while her son was at war, relatives said. She lost weight, too. When word of his injury spread, Fenton's relatives flocked to his hospital in Maryland. Some, from his father's side of the family, came from as far away as Ireland. Fenton lay unconscious as relatives gathered. Diane Fenton held his hand, spoke softly into his ear and played his favorite songs on a radio. Sometimes she would climb in bed beside her son. "I was with him the whole time," Diane Fenton said. Relatives gathered last night at Valentin's house in Little Ferry, where Fenton spent much of his childhood. The phone rang off the hook. Friends brought platters of ziti, salad and cake. And they told stories of the dutiful young man who died doing what he loved: serving his country. FOR IMMEDIATE RELEASE August 5, 2011 CONTACT: Aaron Keyak office: (202) 225-5061 cell: (202) 905-6361 aaron.keyak@mail.house.gov Washington, DC – On July 29, 2011, a bill (H.R. 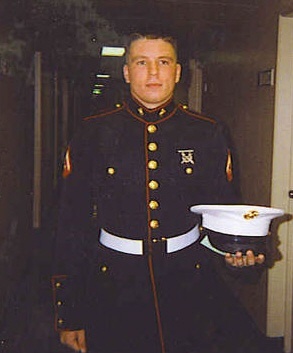 789) to honor the late Marine Sergeant Matthew J. Fenton, introduced by Congressman Steve Rothman (D-NJ), passed the House of Representatives by a voice vote. The entire New Jersey Congressional delegation joined Congressman Rothman as cosponsors of H.R. 789. This bill will rename the post office in Little Ferry, NJ in honor of the memory of Marine Sergeant Matthew J. Fenton, who was a resident of Little Ferry and died in the Iraq war. “Marine Sergeant Matthew J. Fenton is a true American hero and represents the best of our county,” said Congressman Rothman. 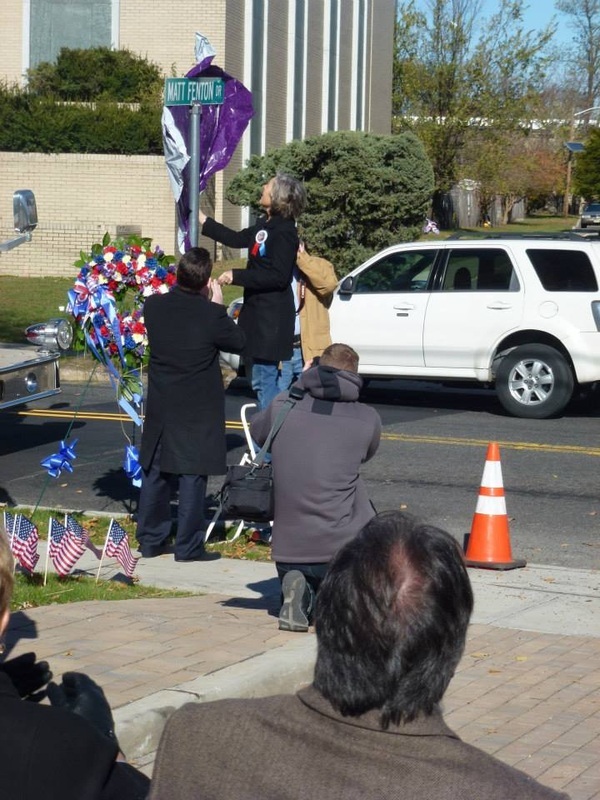 “It is a humbling privilege for me to play a small part in honoring Marine Sergeant Fenton by naming the post office in his home town of Little Ferry, NJ, the ‘Sergeant Matthew J. Fenton Post Office.’ This post office will stand as a testament to his bravery and sacrifice.” At 24 years of age, Marine Sergeant Matthew J. Fenton made the ultimate sacrifice for our country. It happened during his service in Iraq’s Al Anbar province in 2006. Marine Sergeant Fenton was struck by shrapnel after alerting his comrades to the presence of a suicide bomber. All of them escaped harm except for Marine Sergeant Fenton. He passed away nine days later at the national naval medical center in Bethesda, Maryland – a day after receiving a purple heart for his selfless bravery. Sgt. Fenton of Little Ferry, N.J., always wanted to be a Marine and joined the Corps shortly after graduating from Ridgefield Park High School. Matt loved the spotlight and often joked that he was the center of the universe. He was a tough guy with a big heart, puckish humor and the gift of gab who always seemed to be living in the moment. He is survived by his loving mother Diane, father John, sister Courtney, grandmother Harriet Vagts, aunt and Godmother, Allison Valentin, Godson Brandon Valentin, uncles; David and Drew Vagts, Jim and Noel Fenton, aunts; Aimee and Liz, cousins; Joshua and Jen, Drew, Taylor, Will, Ali, Tierney, Taryn, Augie, Erik, Kaitlyn, Kelli, Nick, Shea and Aimee, his girlfriend Andrea Patino and his special family, the Kanes. He died at National Naval Medical Center from wounds received while conducting combat operations against enemy forces in Al Anbar province, Iraq on April 26. He was 24.